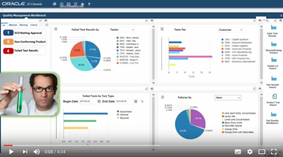 This video shows how you can take advantage of collaboration capabilities to remove friction, spanning multiple systems in your enterprise by leveraging Oracle’s Process Cloud to share documents and Oracle’s Social Network Cloud to manage notifications. You will see a demonstration of how these capabilities can help remove the “friction” from the Engineering Change Process. Disclaimer: The capabilities shown in this video are possible, but not delivered as generally-available (GA) integrated products. Consulting services would be required. Watch the video here.